Facebook’s Terms of service change yet again and this time they are not very nice. I will if these come into effect be removing everything I can from Facebook and asking all my friends to also remove all things that relate to me that they have posted as well. Giving Facebook the right to publish and sell your images and content to advertisers is going to be an issue for photographers as we are not giveen that permission by our subjects when we are photographing them so why should Facebook take this right for themselves. 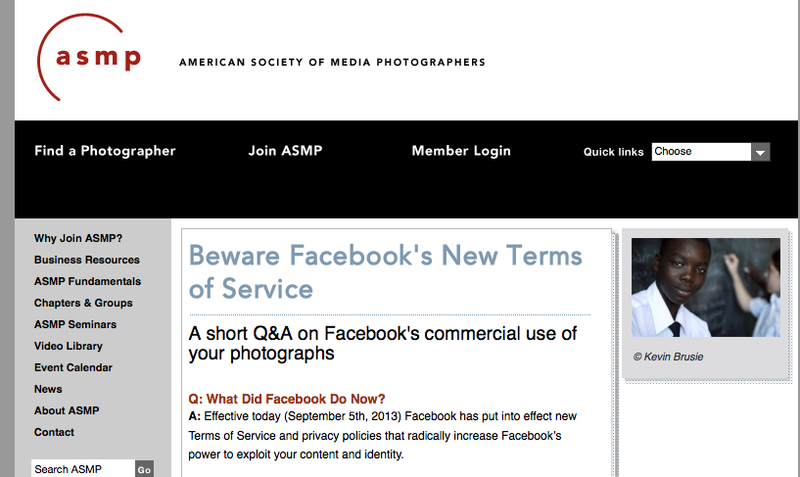 See the ASMP website for more details and the comments here on Facebook itself. I have en example of a problem that I might encounter as a photographer. Imagine that I am photographing someone who is vulnerable someone who is suffering under the governments current economic agenda and I do all the right things like inform them of what I want to do with their image and how it will be used by myself and get their informed consent to make and use their image. Now imaging that someone else decides to use the image in their Facebook account by linking to it as they think that it would be a good idea to highlight the story and or bring it more publicity Facebooks new Terms of Service mean that they can sell the right to use that image advertising whatever, without my or the other persons permission (saying nothing of the subject of the images rights either). This has huge potential problems and would negate any research ethics panels at Universities and social organisations as we will no longer be able to control how an image can be used. Because of the fundamental nature of images, what I am referring to here is that a image can have multiple meanings and that an image can be used for different things depending on words associated with it or the context that it is being used within. “Check out this excerpt from the TOS Changes; the bold text is new additions to the TOS, the underlines are language that is being removed from the TOS. This is one of the most important pieces of language in the whole document.